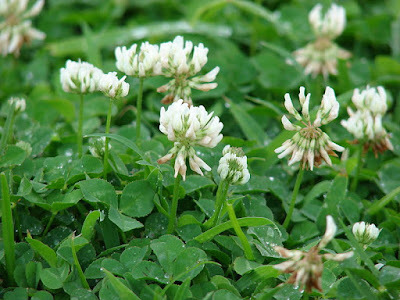 White clover Trifolium repens, copyright Forest & Kim Starr. The section Euamoria of the genus Trifolium is a group of clovers characterised by the absence of an involucral bract around each inflorescence and entire stipules (Basto Folque 1949). Characters (from Basto Folque 1949): Inflorescence without involucral bract. Flowers bracteate; calyx with 10 nerves, not intumescent-vesicular after anthesis; petals white or pink. Stipules entire. [BF49] Basto Folque, N. A. P. de. 1949. Subsídios para o estudo do género Trifolium L. em Portugal. Melhoramento 1 (2): 11–120, est. I–XXIII.